Two years ago, Donna made a calendar of some of her favorite food shots. Last year she didn’t and several people complained. So this year she made one using some of her favorite shots from Ruhlman’s Twenty. I linked each one to one of the twenty techniques and also add some words about the technique and about the dish featured. The dates page includes process shots of the dish where there’s room. They’re printed on demand and shipped by Apple, so they’re a little on the pricey side. Sorry, but unless we wanted to print 10,000 of them they are what they are, $38 delivered. And by all means, let us know what you think! Take a look at Donna’s site Ruhlman Photography. Donna’s photos of Green, Purple, and Orange. Todd & Diane, the White on Rice Couple have great photography on their blog and recipes. This is such a great idea especially to give as gifts for the holidays. In fact, I would love to do this for my own recipes to give to my clients. Although I have to say that my photos don’t compare to those of Donna’s. I’d die to be able to take pictures like her. Beautiful work and great idea. No wonder your friends complained when they didn’t get one this year. 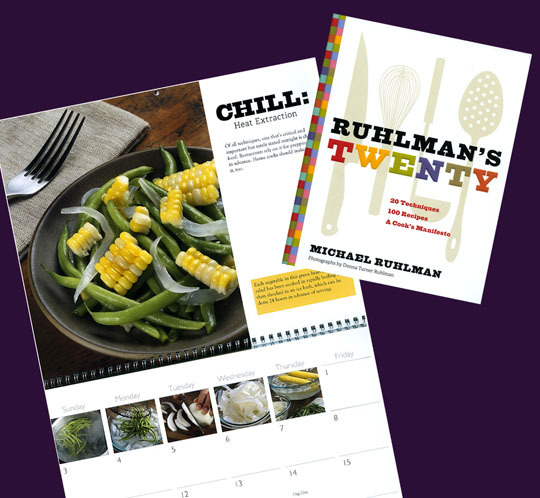 Memohotel Blog » Blog Archive » Ruhlman’s Twenty: The Calendar!